Little Heaven is the latest, and perhaps greatest, horror novel from the mind of Nick Cutter. Like many readers, my first encounter with Nick’s work was with his fantastic debut, The Troop. Even having finished that novel a good four months ago, scenes from it still bubble up from my memory from time to time and make me uncomfortable all over again. That’s a testament to how unsettling his work can be, and I’m not the squeamish sort.. The Deep, his sophomore release, was also creepy to the core. Reading those books, I recall thinking that, while perhaps not as deep or complex as other writers whose names get dropped in discussions of great modern horror, they read like really, really well done horror movies; they’re page turners, at points pushing you on to see what will happen next and at others to see just how dark things can possibly get. This novel was no different. Having not read The Acolyte, I can’t compare it to that book, but I can say without reservation that Little Heaven stands up to the high horror standards set by those novels. On my personal ladder, I would go so far as to say that it goes so far as to challenge The Troop for Nick’s best work. The story follows three mercenary’s across more than a decade as they face terrible evil that has come home to roost. When I read the description, this setup didn’t excite me much since mercenaries inherently feel a little one note to me; macho, grim, militaristic. You get the picture. I was happy to see that’s only partially the case. By breaking the story between multiple time frames, Nick is able to develop these characters into interesting, flawed, human beings. By the back third, only one of them is still the chilly mercenary-type and even he has a thaw by the end. Much of the book takes place far in the New Mexico wilderness, which adds a wonderful sense of isolation to the events of the story. This is a Cutter tale, so you can safely go in knowing that there are monsters and they are wholly evil. It must have spoke to the inner woods lover in me that I found these events much more creepy because so much of it took place removed from society in the woods. You can also assume that things are going to get gross at one point or another, and they do, but I found most of it was in service to the story and not simply to skeeve the reader out [there is a scene toward the end of The Deep with sausage links that struck me as pure, 100% gross out]. Nick has a way of description that gets under your skin and creates images that hang in your mind. Here, you see that with both with both the supernatural and the natural. Many writers craft scenes that are haunting in the moment and then fade into the ether. Little Heaven has at least six that I don’t think I’ll be forgetting any time soon, when most books struggle to create even one. They way he describes The Long Walker or Cyril at the fence or Eli at the window (I’m being intentionally ambiguous)… they’re images that are horribly vivid. And that’s why Nick Cutter’s books feel like really great horror movies. You can see these things. Nick gives you just enough to paint a good mental picture and expertly lets your mind fill in the blanks to wonderful effect. That said, Little Heaven falls short in the same way that The Deep did: there’s just not enough character development in the supporting cast. We’re treated to a good amount of scenes for our three main protagonists and our villain, but the rest are painted fairly thinly, which robs some of the event of their weight. I also felt that the protagonists didn’t quite develop enough throughout the novel. When you meet them, they’re bad people. When you leave them, they’re still bad people, but aren’t completely unlikeable anymore. The story seems to want you to root for these three, but then never lets you forget for long that they’re terrible people who’ve done terrible things. They even question whether they think they’re worth saving. Cutter never quite redeems them enough to make them truly sympathetic. If the book wasn’t so insistent on how terrible they are, I think they would have been easier to connect with. This would have been a major problem, but there is an underlying current of debts paid throughout the text, so even if they’re never truly relateable, it’s easy to see that they want to be better, and here that’s enough. I was very excited when I discovered Little Heaven was on the way and even more so when I was approved for a galley in exchange for an unbiased review. It more than lived up to my expectations and has solidified Nick Cutter as one of my favorite new horror authors. He consistently brings the dark and pulls no punches. 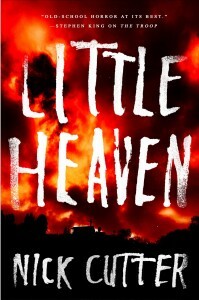 Little Heaven kept me enthralled, and I can’t wait to see what this author does next. The only downside to getting a galley so early is knowing the next book is so, so far off.